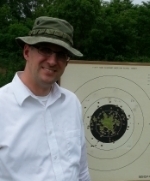 Alex Alphabet and I went and shot a High Power Service Rifle Match today. It was Alex's first rifle match of ANY kind, and my 3rd lifetime match--but match 1&2 were in 1991 and 1993 so I was....a little rusty. I was all kinds of terrible. Alex shot a very impressive 79% average and I shot a 66% average. I would say that getting the rifle zeroed is more important in that game that shooting is!! I was in so much pain cramming my body into those positions, that it really hurt my scores. Wow. I have to say that bullseye is much easier for me! Having a good zero is huge. Flexibility is a plus as well. I grabbed when that Service Rifle carrot was dangled about 30 years ago. This was before the smallbore black guns took over. Service rifle in those days meant 30-06 or 308. Shot one EIC match and captured a bronze EIC badge. Quilted leather jackets out in the sun with the rifle strapped in tight just wasn't my cup of tea. Found other things to do to pass the time. Rob, you did fine especially shooting a 14. It takes a few matches to get good zeros and nail your position down. Racine has matches next weekend if you are so inclined. Do some dry fire practice with your gear on at home to refine your positions. john bickar wrote: Prone hurts. It tends to score well though. Prone doesn't have to hurt. There are positions that aren't painful that score well. I have some arthritis in my upper back. When I look up at something I bend like Batman--I don't hinge my neck up. It was very hard for my to bend my neck that way. I might try that again soon. Now that I have a logbook started, I think I can do better next time. You must be younger and more flexible than I am.